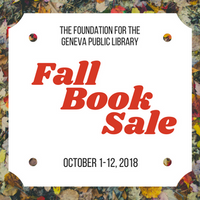 The Foundation for the Geneva Public Library presents their Annual Fall Book Sale! Beginning on October 1st and ending October 12th, the book sale will take place during regular library hours in the community room. A full listing of prices, dates, and times can be found through the Geneva Public Library website.